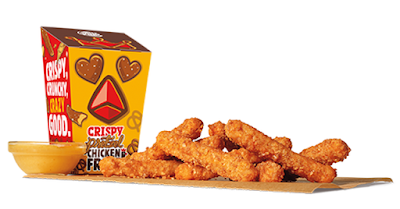 Burger King gives their Chicken Fries a new look this summer with the arrival of new Crispy Pretzel Chicken Fries. Available for a limited time at participating restaurants, the new menu item features fry-shaped white meat chicken coated in a salty pretzel breading seasoned with spices and herbs and then deep-fried. The suggested price per order is $3.09.